My neighbor Art doesn’t have a formal bucket list. But if he did, sky diving would be item #1. He has wanted to try it for the longest time—so long that he doesn’t even remember how long. But life kept getting in the way, and he kept putting it off for various reasons. Then, a couple of years back, it looked like health problems had closed the window of opportunity on Art’s dream. That all changed, though, when he had a pacemaker installed. He began daily workouts in the exercise room in our clubhouse. Besides improving his overall stamina, he needed to strengthen his legs to withstand the landing. Once he was ready physically, Art had one more thing to do. 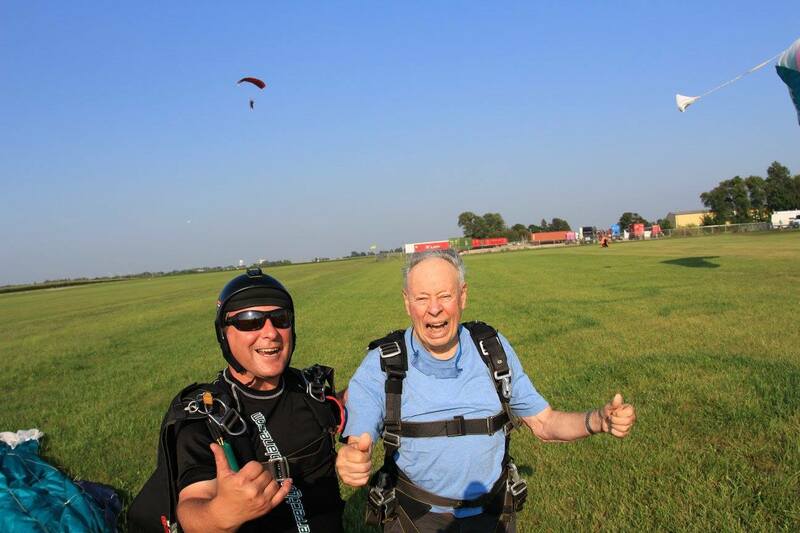 He had to convince his family that it was a good idea for him, now a month shy of 87, to jump out of an airplane. He had a plan for that, too, one that he set into motion last week. 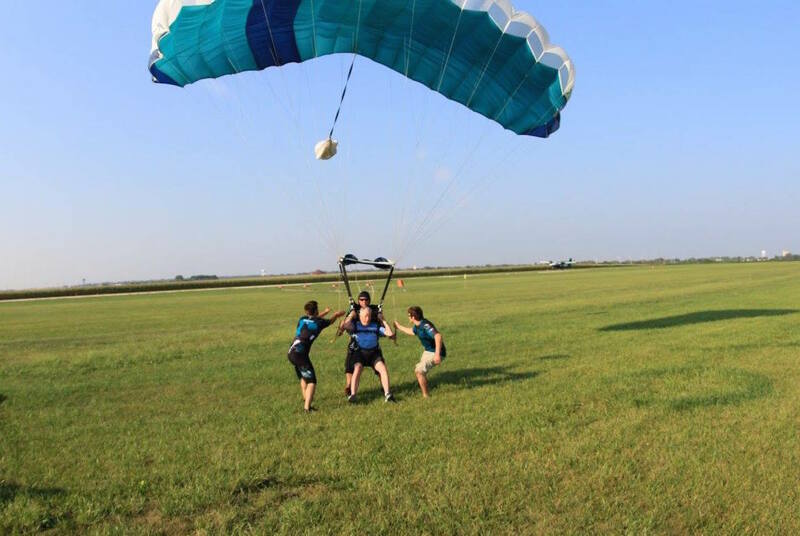 He invited his wife, Judi, and his sons to join him for lunch at the Rochelle Municipal Airport, where Chicagoland Skydiving Center is located. The food is good, he said, and they could watch the jumpers. That was all, he assured them, just watch. Judi and one son, Don, were able to go, and off they went on Sunday. What Art didn’t tell them, was that he had decided to ask if there were any openings or last minute cancellations when he got there. He did, and found out there was an opening later that afternoon. As they watched others sky dive, Judi’s fear of his breaking a leg or hip on landing were eased. She saw how gently they came down. With his family on board, Art upgraded his package. 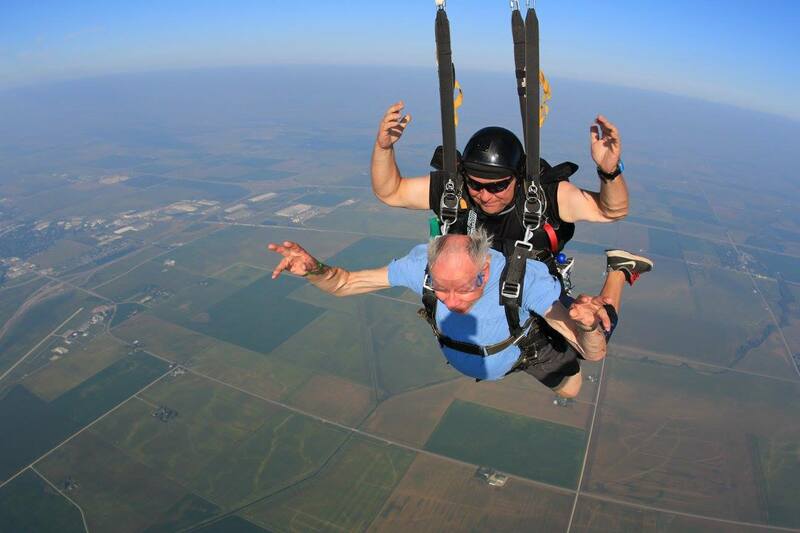 Rather than jumping from 9,000 feet, he would go for the higher jump at 14,000 feet. They also decided on a video and picture package, one where the cameraman jumps at the same time to record everything. The photos below are part of that package of professional shots. 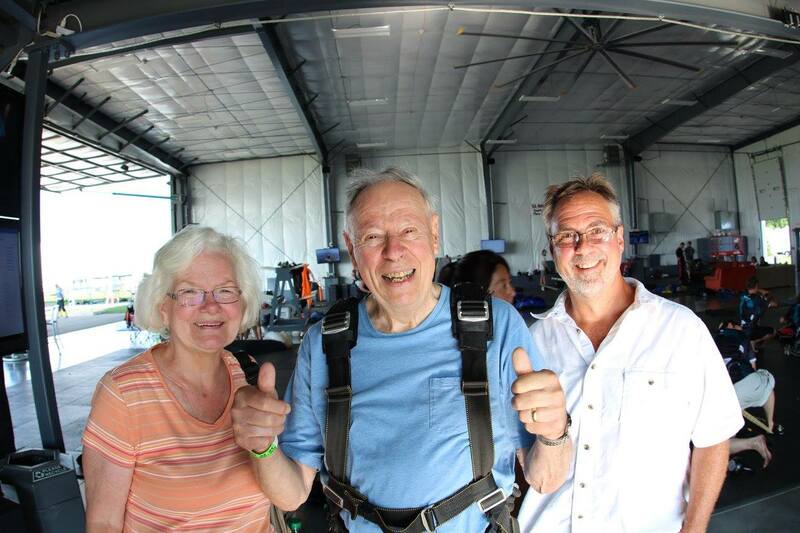 Here are Judi, Art, and his son, Don, before the jump. Note how excited and confident they all appear. 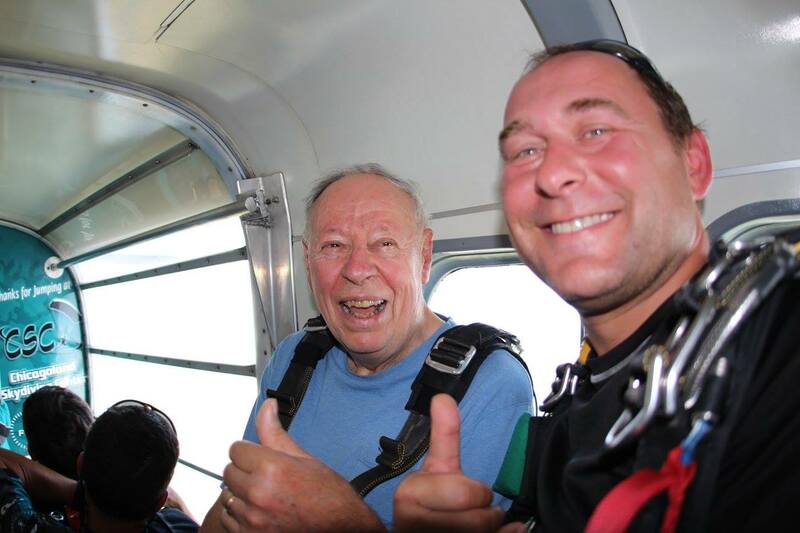 Even in the plane, moments before he jumps out with his tandem partner, Peter, Art shows no sign of fear or nervousness. Have you ever seen a man look more alive than Art does here? The landing was as gentle as promised. He literally landed on his feet. 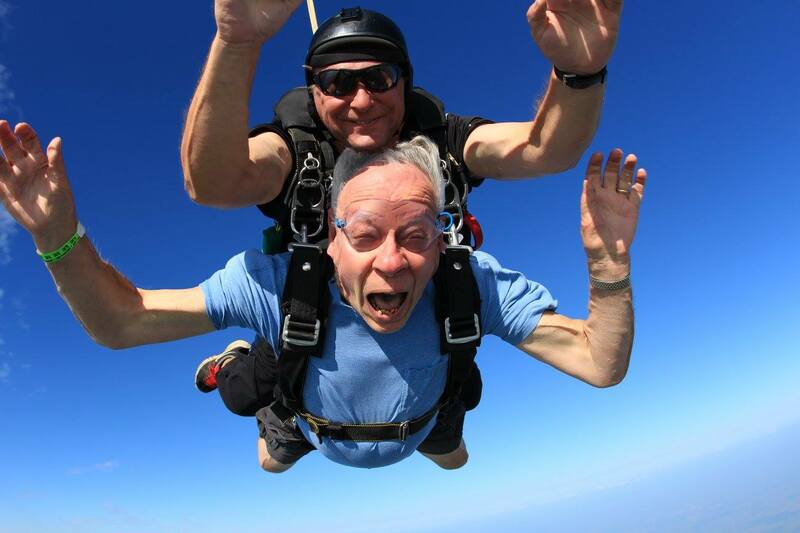 Peter told Art that he was the oldest person he jumped with, but who’s to say what is too old? Knowing Art, I wouldn’t rule out another sky dive in his future. Awesome! Just saw Art a few minutes ago and he told us what a thrill it was. Caryl, thank you so much for this beautiful article. You captured the heart and thrill of an outstanding experience!! Judi, I had a blast writing the article. Thank you to you and Art for making it possible. Isn’t he amazing? Thanks for commenting, Brenda. Gloria, thank you for posting this comment. Art is indeed amazing, but so are you! Love you!